Dumb question: I decided to upgrade from the Mini to the full blown USB with fancy aluminum case. However, I can’t find anything that tells me which antennas are which. BTW, the antennas that come with it are tiny. So far they don’t pick up much. I decided to upgrade from the Mini to the full blown USB with fancy aluminum case. However, I can’t find anything that tells me which antennas are which. Unfortunately this does not help. The unit came assembled with the Aluminum case. I have no way of knowing which antennas are connected to which port. The case is not marked. The case also came assembled with some type of “security” screws so I can’t unscrew it. Eventually I’ll need to get bits for the security screws, but for now I need to know the external layout. Also, for those Interested I suggest you do not buy the Aluminum case. It blocks everything off except the four antenna ports, and the USB port. It even blocks off the DC input port. In my case I’d really like to get to the DC port since my high end laptop’s USB 3 ports can barely handle an iPhone, much less the Lime. It does look good, but may not after I start drilling some holes. The antennas that come with it are total junk as well. I can barely pickup a 433mhz transmitter held 12 inches from them. The other bands are equally bad. Barely anything comes in at any frequency. You should also be aware that there is very little clearance between the antenna screws on the aluminum case and the case. So, about the only antennas that will fit directly are those tiny ones it comes with. You can, of course add cables to the case and mount the antennas at the end of the cables, but that does make things less portable and a little uglier. This isn’t a huge deal for me, but it is not evident from the pictures at Crowd Supply so I thought I’d pass the information on. I don’t know if they did the same thing with the plastic case, but it doesn’t look like it. One other thing I thought strange. There is no DC port plug soldered on this board. Unless they aren’t shipping with on any USB boards then perhaps this board is unique to those shipped with the aluminum case? Is the DC port obsolete? On the ones with the HF fix the RX1L port is swapped for the RX1_W port. So, is there some logic to which ones have the HF fix in them? That is, those shipped before/after a certain date or did I need to request that on order? How can I be sure if the HF fix is in mine? I vaguely recall that this involved an inductor (or something) is bypassed but I don’t recall the details. Just want to make sure that this is what you meant… I am not sure I want to crack this open just yet. Yes, this is my recollection. It has been a while since I opened mine. However, if you want the wide band reception you really do need to open it up and switch the ports. I would strongly suggest that. I don’t know why they did it the way they did. The wide band receive is much more useful than just another limited band receive port. Of course, yours may be different than mine. They may have changed things in the last six months or so. Please be aware that the snaps attaching the antenna leads are quite small. It takes a good magnifier (for me at least) to align them and snap them in. They require a somewhat firm press, but don’t overdo it either. Thank you, I will be opening up mine here shortly. So what did you change about your set up? Did you change the antennas? Or just the layout? Can you show me via picture OR describe it? 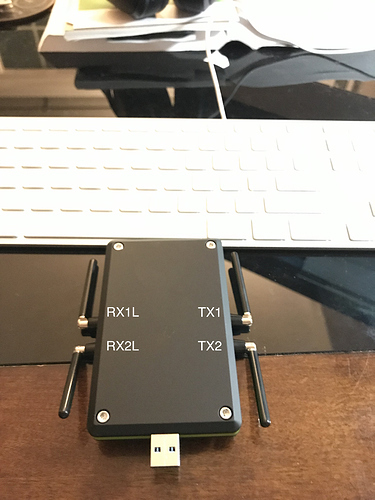 Right now just received the SDR, playing with it when not studying :). BUT on initial power up (once I got it connected) super weak reception compared to my cheap SDRs?? Maybe the antenna layout is the cause? Appreciate your post btw. Cheers! All I did was disconnect the one of the transmit antennas and hooked it up to a wide band port. I currently don’'t need two transmit ports. Note that the default sensitivities for the non wide band ports are at the high end. I’ve forgotten exactly, but I think that it is in the 500+ Mhz range. If you want anything lower the wide band port is probably more appropriate. The cute tiny antennas are completely useless for anything. You will need a real antenna. I got a telescoping antenna and it help immensely for my initial exploring… The sensitivity of the SDR with a real antenna is actually very good. When connected to my ham radio antenna it actually has better reception than my dedicated ham radio. That said, it does tend to pick up harmonics from the non-centered frequency range. Ideally you would put in filters to get rid of some of these. In particular, FM broadcasts tend to keep interfering. For instance, if you are looking at 20Mhz range and hear your local FM station to you you are hearing a harmonic. I bought a cheapo ($8 or so?) band block filter to get rid of these (when I’m not deliberately listening in that range). It definitely helps to block them so that you can hear what you are trying to hear. However, you probably DO want to try FM frequencies initially so you can get used to using the SDR and software. All the software available for listening to or examining signals is far from perfect. I have tried several. Some aren’t user friendly. Some tend to crash. What you want to use depends on if you are using Linux or Windows. For Windows I prefer SDR Sharp. I do think that getting started is easier on Windows. For more “power” try Linux, but the Linux setup is somewhat more complicated. BTW, I have previously complained to the vendors about the antennas included with the SDR. They really are USELESS. I encourage you to complain as well. I did purchase some 6/8 inch antennas for the 433Mhz and 900Mhz ranges. These connect directly to the SDR. For the telescoping and high end antennas I purchased these: https://www.amazon.com/gp/product/B073JWDXMG/ref=oh_aui_search_asin_title?ie=UTF8&psc=1. These were a good compromise for initial testing purposes. The large antenna that comes with this gets you a good look at the WiFi (2.4Ghz) signals. The telescoping antenna is good for a variety of bands for reception. I don’t know about transmission. For that you need a resonant antenna. Be careful when ordering antennas. You want SMA Male. Many antennas on Amazon say SMA, but they don’t specify male/female. Either that or I got careless. I also bought a variety pack of SMA adapters (various flavors) that has come in handy. I also bought a variety pack of UHF to SMA adapters. A pack of SMA extension cables has been useful. Good luck. If you get stuck on something please ask. WOW! Thank you very much, All the information you have gave is excellent!! So maybe a proper antenna would help with my weak reception. AND I guess once I pop open the SDR, I’ll move one of the TX antennas, that sounds a little more daunting. I don’t want to break the new SDR but, I need to get access to that Wide Band stuff, it is where I planned to start to get familar with this one. The small cheap SDRs are so much easier to deal with… I am on a Mac, and that adds a layer of ‘fun’ to things. I am tech enough to fix, but man… you would think there would be more support for the Mac community. But I digress. I want to get to the Ham stuff, but first need to get this working well… gnu radio installed and now onto the fun antenna stuff. I really appreciate you answering and helping out. AND thx for offering to help when I get stuck cuz I will get stuck LOL.